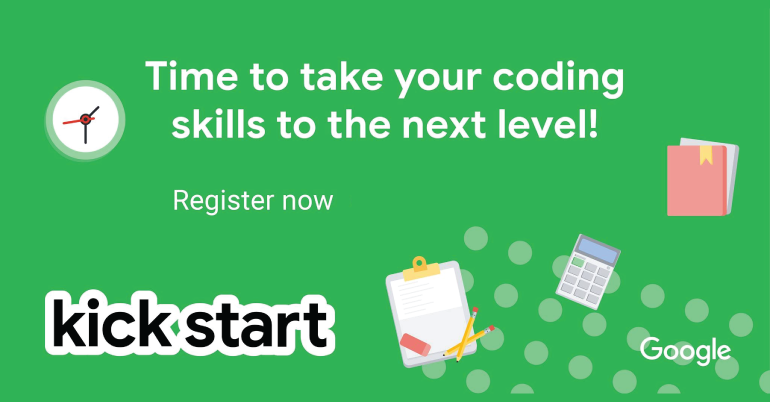 Kick Start hosts online rounds throughout the year, giving participants the opportunity to test and grow their coding abilities while getting a sample of the programming skills needed for a technical career at Google. Kick Start is a global online coding competition, consisting of three-hour rounds of a variety of algorithmic challenges designed by Google engineers. Participants can compete in one or all online rounds held throughout the year, and will have the opportunity to develop and grow their programming abilities while getting a glimpse into the technical skills needed for a career at Google (top participants may be invited to interview at Google). The rounds are held regularly throughout the year at different times so they are easily accessible to coders everywhere. Each Kick Start Round is open to all participants, no pre-qualification needed, so you can try your hand at one or give them all a shot. Register for Kick Start once on the website and you’ll be set up to compete in any round you’d like! When each round is open, the three hour countdown begins and you’ll compete on their website solving algorithmic and mathematical problems. Following the round, you can check out your rankings, the round analysis, and if you were a top competitor, you may be contacted by Google for a chance to interview. The contest will run on a new platform. On the old contest platform (2018 and before), for each test set, contestants downloaded input, ran code locally on their own machines, and uploaded the output for judging. On the new platform, there is nothing to download or run locally; contestants submit code for judging, and that code is run against each test until it fails one of them or passes all of them. The new platform enables interactive problems in which your code communicates with our code. See the Interactive Problems section for more details. These changes are reflected in the contest interface, submission system, and scoring system, and are explained in more detail in the rest of the FAQ. The basic idea of the contest has not changed: contestants still write code to solve interesting and fun algorithmic problems, using the same skillset as before. The round structure is the same and the scoring system is similar. Apply online through the given link. Check the Rules & FAQ section in the official website.
. Please note that they may need some time to answer your question. The top competitors from our Kick Start rounds may be invited to interview at Google! Check the FAQ section in the official website for detail eligibilities. Check the Rules & FAQ section in the official website. If you have a question which is not answered in the FAQ, you can email at kickstart@google.com. Please note that they may need some time to answer your question.